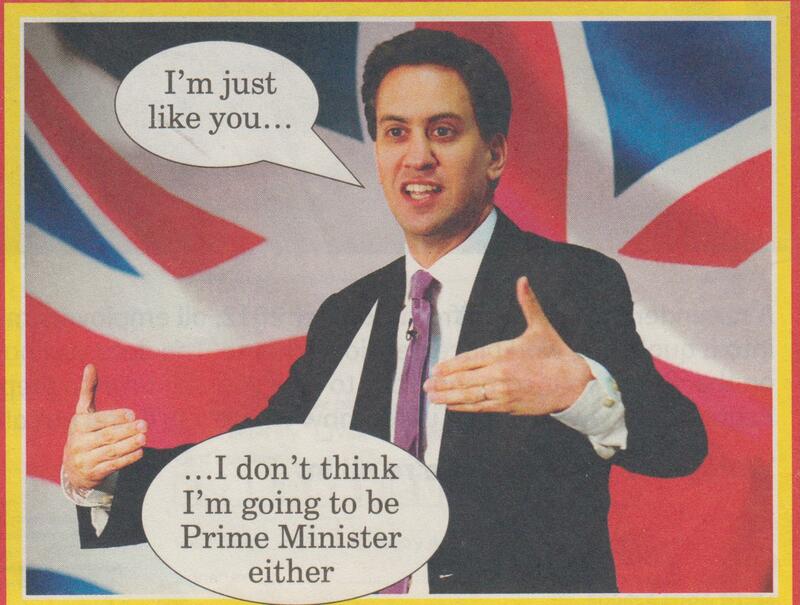 Private Eye’s satirical view of Labour leader Ed Miliband from the cover of their edition for 5th -18th October 2012. There has been increased criticism of Ed Miliband this week after an open letter signed by 28 left-wing activists was published in the Guardian criticising Miliband’s electoral strategy. Many traditional Labour supporters and voters have been increasingly alienated by Labour’s move to the Right and its policy of adopting harsh Tory policies and attitudes towards the poor. Miliband has stated that he wants to reach out to the middle classes, and this week ordered the parliamentary Labour party to vote with the government for the imposition of an overall benefit cap. Although Labour would be better by far than another Tory government after 2015, Miliband’s leadership seems to demonstrate many of the problems and attitudes of the modern political elite: very middle class, with little awareness of or sympathy for the problems and hardship experienced by the poor, the working class, the disabled, and unemployed. Much of this attitude began under New Labour with Tony Blair. Own Jones in chavs describes how the political elite have played down the existence of class in order to ignore the working class to concentrate on gaining middle class votes, quoting the politicians Jon Cruddas and Matthew Taylor, one of Blair’s aides. Jon Cruddas is in no doubt that politicians of all colours have a vested interest in denying the existence of class. It has proved an effective way of avoiding having to address working-class concerns in favour of a small, privileged layer of the middle classes. “They devise ever more scientific methods of camping out on a very small slice of the electorate … those who are constituted as marginal voters in marginal seats.’ Working class voters were taken for granted as the ‘core vote’ who had nowhere else to go, allowing New Labour politicians to tailor their policies to privileged voters. Tony would always say, fine, but I don’t need to worry about that, because that’s what everybody else in the Labour Party wants, and that’s what everybody else in the Cabinet wants, and that’s what Gordon [Brown] wants, and that’s kind of fine. And I’ll leave them to do that, because I know that’s how they’ll spend all their time. They don’t want to do public service reform, they don’t want to wealth creation, they’re not interested in any of that, they’ll just kind of hammer away at that agenda. My job is to appeal to the great mass of people on issues that the Labour Party generally speaking is just not interested in. The parapolitical magazine, Lobster, has printed a number of articles analysing and critiquing Blair, New Labour and their policies. One of the most important accounts of the origins of the New Labour project is the article, ‘Contamination, The Labour Party, Nationalism and the Blairites’ by the editor, Robin Ramsay, in no. 33, Summer 1997, pp. 2-9. Ramsay views the emergence of what later become known as New Labour in Neil Kinnock’s change of policies following their 1987 election defeat. Kinnock had previously been very left-wing. In his book Making Our Way, according to Ramsay ‘had come close to a radical, anti-finance capital, anti-overseas lobby, pro-domestic economic policy’. This changed after the election defeat, when Kinnock and his economic advisor, John Eatwell, enthusiastically embraced the free market and EEC. He notes that when a group under Bryan Gould produced the report, Meet the Challenge, Make the Change, Eatwell, Gordon Brown and Tony Blair objected to the sections recommending a return to national ownership. An Economic Secretariat was created under John Smith, including advisors from the City of London. Kinnock and Smith became pro-EEC and were convinced that Britain should join the Exchange Rate Mechanism. At a Shadow Cabinet meeting on the 16th November 1989, the Labour leadership followed Smith’s advice that the state could not stimulate the economy, either through the nationalised industries or local councils, because this was prohibited under the rules of the ERM. The Labour Party thus launched the ‘prawn cocktail offensive’ to win over the City of London, in which John Smith and Mo Mowlam assured the bankers that they would not attempt to limit their profits any more than Thatcher had. This resulted in the establishment and expansion of a series of groups creating links between the Labour party and the financial sector. These included the Smithfield discussion group, the Labour Finance and Industry Group, and the Industry Forum. The Labour Finance and Industry group represented the interests of the domestic sector, while the Industry Forum and the Norton group presented the interests of the overseas lobby – the City of London and the multi-nationals. In short, the people round Blair are all linked to the United States, or the British foreign policy establishment, whose chief aim, since the end of the Second World War, has been to preserve the Anglo-American ‘special relationship’ to compensate for long-term economic decline. The Blair’ group’s orientation is overseas: this is the territory of the Foreign Office and its think tank satellites like the Royal Institute of International Affairs – the political and propaganda apparatus of the overseas lobby. (p.7). Blair himself also announced before the annual conference of Murdoch’s News Corp that the Americans had also insisted that Britain should adopt a more pro-European policy. Due to the massive expansion in overseas investment under Thatcher, Britain was second only to America in this regard and so looked to American political and military power and influence to protect those interests. The result was an increase in support for Labour over the Tories in the London establishment over the Conservatives. The result was a complete reversal of attitude towards the City of London. Whereas the Labour report, Meet the Challenge Make the Change: A New Agenda for Britain had been highly critical of the influence of City of London, the latter was held up as a great success seven years later by Mandelson and Roger Liddle, in their book, The Blair Revolution. Liddle, incidentally, now writes for the Spectator. ‘The concentration of power and wealth in the city of London is the major cause of Britain’s economic problems’… and that Britain’s economic policy had for too long been dominated by City values and run in the interests of those who have assets rather than those who produce. The Blair Revolution, however, described the City of London and the new, de-industrialised British economy in glowing terms. Britain can boast of some notable economic strengths – for example, the resilience and high internationalisation of our top companies, our strong industries like pharmaceuticals, aerospace, retailing and media; the pre-eminence of the City of London. Ramsay goes on to describe what this change of attitude actually means for everyone else in Britain outside the elite financial circle of the metropolis. That the British economy policy is ‘outward-looking, internationalist and committed to free and open trade’, in Blair’s words, is precisely the problem from which non-metropolitan Britain has suffered. These are the values of the overseas lobby, the Home Counties financial elite, people for whom Bradford or Norwich, let alone Glasgow and Cardiff, are far away places about which they know nothing – and care about as much. British politics has been stood on its head. The Conservative Party, traditionally the party of financial and overseas interests, has been replaced in that role by Labour. Instructed by its new friends in the City, Labour has become the party of financial- that is pre-Keynsian – orthodoxy. Gordon Brown looks determined to re-enact the role of Philip Snowden in 1931. The last three years of the Major regime saw Chancellor Kenneth Clarke running the kind of orthodox Keynesian policy – increasing government deficits in response to the recession – which Labour, under Wilson or Callaghan, would have run, but which is anathema to ‘Iron Chancellor’ Brown. (p. 8). The Blair faction will fail. ‘One nation’ rhetoric, continuing membership of the institutions of the New World Order – which is essentially the same old American post-war order minus the Soviet challenge – and leaving economic policy to the overseas sector won’t affect the real structural problems of the British economy. When it does finally dawn on the Parliamentary Labour Party that it won’t work, they will have to look elsewhere. The wrong turning was taken at the point when Bryan Gould was defeated by John Smith and the party leadership decided to surrender to the overseas lobby. To that disjunction it will have to return. (p. 9). This is the origin of New Labour and the background to Miliband’s continuing attempts to appeal to the Middle Class and the financial elite at the expense of the poor and working class. And it needs to change urgently. Even so, a Labour government would be far preferable to another Tory government. If nothing else, Labour have said that they will stop the Tories’ privatisation of the NHS. But for Labour truly to start tackling poverty and unemployment in this country, it will have to jettison much of the New Labour project and start returning to its working class roots.